JOE SCARBOROUGH: Yesterday, way too late in the afternoon, I did an hour on "Super Tuesday" [MSNBC's weekly Election 2008 special] and was interviewing A.B. Stoddard, journalist of "The Hill," and I asked her about Barack Obama, was he going to step forward? And she gave a great answer, and she said what a lot of people are not saying right now, she said, "you know what, Joe? He just doesn't have it in him." SCARBOROUGH: And I don't think he does. I don't think he has it in him to attack Hillary. I don't think he has it in him to speak in soundbites. I don't think he has it in him to do the sort of things you have to do day in and day out to energize people on campaign trails. Mike Barnicle said he's been to see Barack Obama and was excited about Barack Obama. But he says the guy, everybody goes there, they're excited, they listen to him, and then they all just sort of walk away. He says it looks like the guy is playing for 2012 or 2016, that he just is not igniting. 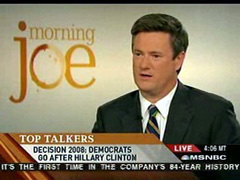 Panelists Willie Geist and Mika Brzezinski didn't dispute Joe's analysis. WILLIE GEIST: Well, it's something we talked about yesterday. He put himself out there as someone who was going to go after Hillary last night, and we said, OK, we're all waiting. You've set the bar, what's it going to be? And he did, but it's not, maybe, what a lot of people are hoping for. So if that's him going after Hillary, it's not going to fire people up very much. MIKA BRZEZINSKI: I think at this point, something would have to derail her, and I don't see that happening. I may be wrong. My take: I think Joe is onto something. Barack Obama's candidacy may go down in political annals as a textbook case of sizzle over steak. Obama enjoyed tremendously positive MSM coverage when he first burst onto the presidential scene, and American voters, certainly Dem primary voters, seemed very open to considering him as a serious alternative to Hillary. But he has failed to deliver on the political promise of his stunning debut. I also share Scarborough's positive assessment of A.B. Stoddard of "The Hill." I've caught quite a bit of Stoddard over the months, but yesterday in particular heard her at length during the day on MSNBC. No one would mistake her for a closet conservative, but I find her smart, insightful and mature.